I reached an initial idea as a starting place for a group show I got accepted to with a theme of "Escape". This group show is with YPA's Mentoring Program, and we had our initial meetings last week. I have turned "escape" into a camouflage/chameleon theme for myself after a couple of massive word maps. 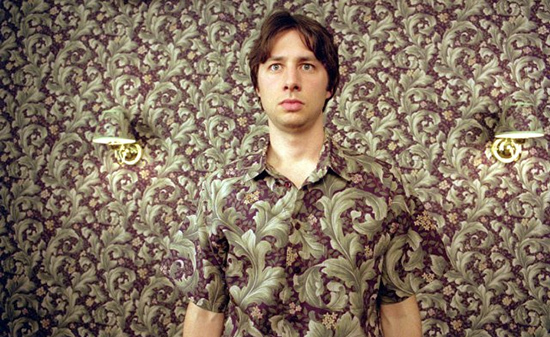 The first image that popped into my head was a scene from Garden State, where left over curtain pattern was made into a shirt (that happened to match the wallpaper) and was gifted from a quirky aunt to the main character during his own mothers wake. This film twists and turns with dark humor and unforgettable one-liners. The main character, Andrew Largeman, has become a character with great reference for me to start with for my own posing thoughts. He is someone throughout the film that seems to walk on eggshells around himself, as if he might disappear if he isn't careful. From here, I loved the idea of having a large graphic, flat surface with me, instead of having complicated 3D spaces to project onto. As the search continued to find more photographic influences, I came across the oh. so. talented. Cecilia Paredes. Cecilia Paredes creates work by a process she refers to as a "photoperformance", where she uses paints and other materials to camouflage herself into elaborate environments. This transformation that occurs is beautiful, elegant, and mysterious all at the same time. When all else fails, dig deeper.